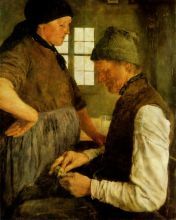 Wilhelm Leibl (October 23, 1844 – December 4, 1900) was a German realist painter of portraits and scenes of peasant life. 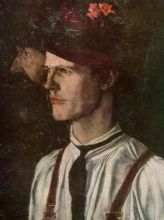 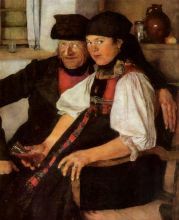 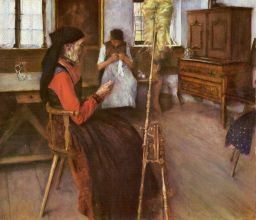 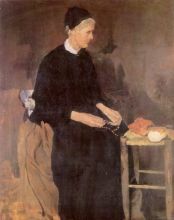 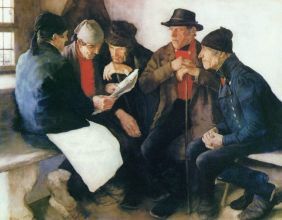 Leibl was born in Cologne and in 1861 began his first training with Hermann Becker, a local painter. 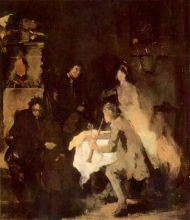 He entered the Munich Academy in 1864, subsequently studying with several artists including Carl Theodor von Piloty. 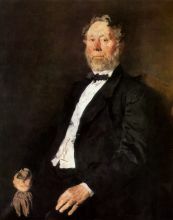 He set up a group studio in 1869, with Johann Sperl, Theodor Alt, and Rudolf Hirth du Frênes. 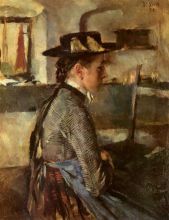 At about the same time, Gustave Courbet visited Munich to exhibit his work, making a considerable impression on many of the local artists by his demonstrations of alla prima painting directly from nature. 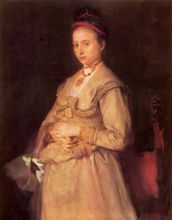 Leibl's paintings, which already reflected his admiration for the Dutch old masters, became looser in style, their subjects rendered with thickly brushed paint against dark backgrounds. 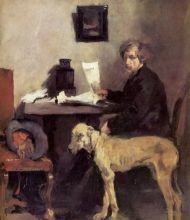 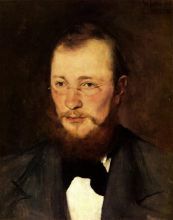 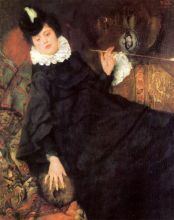 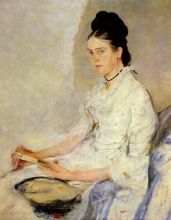 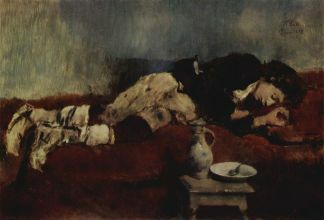 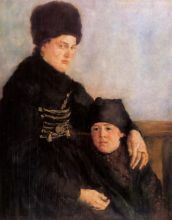 Later in 1869, Leibl went to Paris for a nine month stay during which he met Édouard Manet. 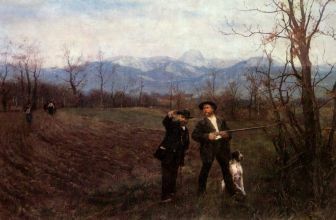 Upon his return to Germany, Leibl lived in Munich until 1873, when he moved to the isolated Bavarian countryside. 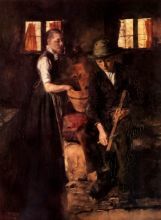 Living among peasants, he depicted his neighbors in everyday scenes devoid of sentimentality or anecdote. 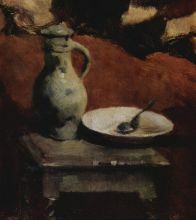 The sketchlike quality of his painting was replaced by greater precision and attention to drawing. 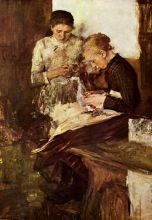 Living from 1878 to 1882 in Berbling, he painted perhaps his best-known work, the Three Women in Church (Kunsthalle, Hamburg). 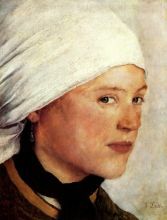 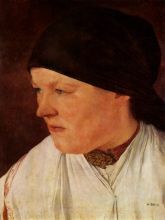 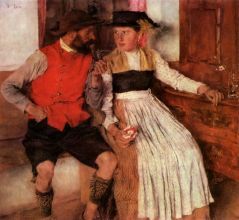 Its intensely realistic style recalls Hans Holbein in its clarity of definition. 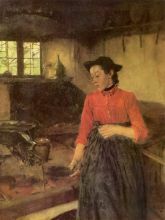 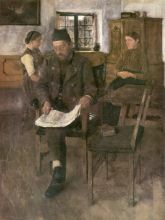 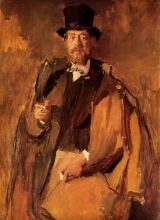 During the following years he moved to the town of Aibling and, in 1892, to Kutterling, as his paintings united the disciplined drawing he had adopted in the 1880s with a new delicacy and luminosity. 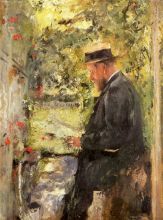 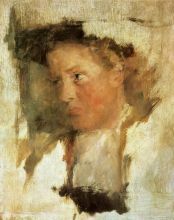 Leibl painted with no preliminary drawing, setting to work directly with color, an approach that has parallels to Impressionism. 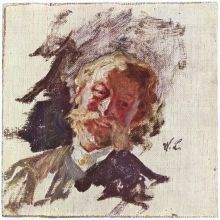 His commitment to the representation of reality as the eye sees it earned him recognition in his lifetime as the preeminent artist of a group known as the Leibl-Kreis (Leibl Circle) that included, among others, Carl Schuch, Wilhelm Trübner, Otto Scholderer, and Hans Thoma.